The most important decisions we make in life often come when we’re least prepared to make them. Young adults are the best positioned of anyone to make investment decisions that will lead to future financial freedom. As with anything, investing has its own ground rules; guidelines that make investing more methodical and more rewarding. Start yesterday – Nothing has a larger impact on your returns and size of your investment portfolio than time. For the first few years the majority of the growth in your net worth will come from what you save and invest, not the returns from your investments. Even those who started investing at inopportune times…say, right before the financial crisis, still have positive returns and more money than people who never saved or invested at all. Use tax and legal shelters – The 401k and IRA are two of the most under-appreciated accounts on the planet. A 401k or IRA will shield you from taxes, allowing you to make maneuvers that result in the lowest possible tax bill. Additionally, a 401k and IRA are like financial bomb shelters in most states. While someone can sue you out of house and home, 401ks and IRAs have up to millions of dollars in protection in most states. No one can take from a retirement plan but you! Diversify – Investing isn’t about betting it all on black or red. In the long-run the expectation is that the financial markets will grow your wealth, even though some investments will crash and burn. A well diversified portfolio of stocks and bonds protects you against risks while giving you exposure to the upside too. Conservatism is for old people – Risk is generally understood as the volatility of an investment portfolio – how fast it goes up and down and how far it can go up and down in value. Young adults have plenty of time to ride out the ups and downs and should accept more volatility risk for higher returns in the long-run. That means having a portfolio that is mostly stocks and light on bonds. Keep a level head, no one else does – Investment portfolios are built for goals that may be years and even decades away. What happens between the start and the end won’t always be rosy. Some years are great – 2012 was a great year for stocks – but 2008 was absolutely awful. While it’s not always easy to keep your sights on the long-run, those who have the stomach to stick with it even when it looks like the sky is falling log the best performing portfolios. Look at the big picture – Your investment portfolio is a piece of a complete financial pie; don’t look at it in isolation. For example, someone who has a large credit card balance should pay it off before investing; the returns are that much better. Likewise, a young adult with student loan debt should consider paying it off before investing in bonds – the effect is the same, or even better when bond yields are this low. Time produces diminishing returns – While you should spend some time each year to review your investments, most people find that each additional hour spent thinking about investing produces fewer and fewer benefits. Unless you plan to work in finance, spending 40 hours a week tending to your portfolio is unlikely to provide much more benefit than spending 2 hours a year reviewing and tweaking your fund exposure. Don’t listen to your friend’s hot stock tip – Believe it or not, you can like and buy a stock without knowing anything about it…many people do. You’re certain to hear of a few awesome new investment ideas from friends and family, but unless your friends or family can tell you every last detail about a business, they’re investing with less information than professionals they’re competing against. Avoid these situations at all cost; there’s no reason to risk money and friendship in the same transaction. The best investors make the fewest mistakes. No one can give you perfect advice – there’s no such thing as a perfect investment record. Avoiding the big pitfalls is the best way to get the most out of your investment portfolio. Hopefully you guys can help me out here. Readers, what’s the best advice someone has ever given you about investing? Great tips! I agree with Savvy Scot, start yesterday is probably the best one. Don’t let your fears stop you from starting. Great tips! Time is of the essence, so it is vital to start as soon a you can. Even if you can’t invest a lot in the beginning, it’s vital to get started and establish that discipline. 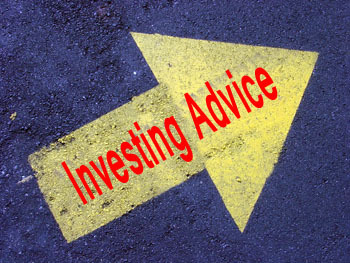 My advice is to have a plan to guide your investments, that’s a huge help to separate emotions from the investing. Ah, a plan definitely wouldn’t hurt to make it easier to ride the ups and downs! Another 2008 moment is probable sometime in a young investor’s life, so being emotionally able to ride it out is definitely a valuable skill to have. Starting early and keep adding to your investment are the two most important factors. You’ll be glad you started investing early and often. Conservatism is for old people is a great point. So many young people like myself saw the massive crash of the recession and are scared. I believe in the long term average returns and if you’ve missed the last couple years you’ve missed out on a lot! I think this is one of the more concerning trends. Younger people today are much more conservative than in the past. If you go too safe you create a much bigger risk in running out of money. Normally, I would not want to suggest specific investments, but I will make an exception. I think to start a young person should invest in a broad index fund. It is a good start and probably something everyone should have in their portfolio. The best advice I’ve heard is start young, get aggressive and save as much as you can afford. The best advise I’ve ever been given is from my brother. He encouraged me to start a Roth IRA before I turn 18. This will give me the upper hand on retirement investing, and hopefully I’ll become a 40 year old millionaire. That is needed if they’re likely to provide you securities. Past performance is no guarantee of future returns. the old employees around too. Make sure to give the customer what they really want or can afford. There are no state regulations prohibiting funeral homews from Texas are listed inn this online directory. Hi, I'm Corey Fick. I'm a husband, college graduate, young adult, and non-profit manager. I enjoy learning new things about personal finance and sharing them with my loyal readers. Join the conversation.